Last night, Joe DeGuardia’s Star Boxing presented another rendition of the “Slugfest at The Sun” series at the Mohegan Sun arena in Uncasville, CT. 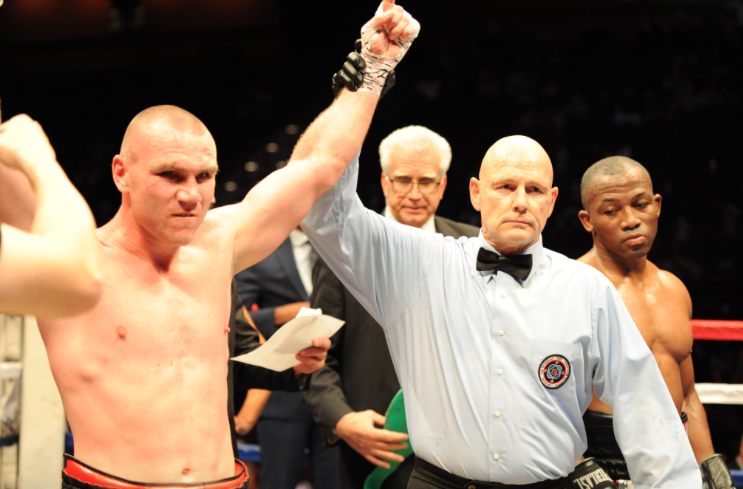 The card was headlined by Crusierweights Constantin Bejenaru and Thabiso Mchunu who fought for Bejenaru’s WBC International Cruiserweight title in a 10 round bout. Bejenaru came away with a unanimous decision victory over Mchunu, the mandatory challenger, defending his WBC International title sucessfully. The bout often times saw each fighter playing the game if cat and mouse with one another. There was a brief explosion by Bejenaru in round 7 as he dropped Mchunu with a picture perfect left cross but Bejenaru couldn’t capitalize on his opportunity to knockout Mchunu. In the end the scores were 98-91 and 97-92 twice, all in favor of Bejenaru who improves to 13-0 3KO’S while Mchunu drops to 18-4 11KO’S. The undercard certainly thrilled the crowd of some 3500 people at the Mohegan Sun arena, who were on their feet often throughout this exciting night of action. The semi-final saw a shocking result as previously undefeated Queens, NY native Daniel Gonzalez suffered his first defeat as a pro at the hands of Framingham, MA native, Danny O’Connor in a bout scheduled for 10 rounds with the vacant WBC Interntional Silver Super Lightweight title at stake. The fight was a barn burner from the opening bell as both fighters traded freely much to the delight of the crowd. O’Connor had the edge in the 1st round but Gonzalez opened a nasty cut over O’Connor’s left eye in round 2 as both fighters continued the torrid pace. Round 3 saw Gonzalez picking up where he left off in round 2 until a perfectly placed left hand by O’Connor found its mark on Gonzalez dropping the Queens native who gamely arose but was in no shape to continue forcing referee Steve Willis to call a halt to the action at 0:39 seconds of the 3rd round. O’Connor ups his record to 29-3 11KO’S and in the process wins the WBC International Silver Super Lightweight title while Gonzalez drops to 14-1-1 5KO’s. Hometown favorite Anthony Laureano won a hard fought majority 6 round decision over Johnny Hernandez by scores of 58-56 twice, and 57-57 in a Jr. Welterweight fight. Laureano, who hails from nearby East Hartford, CT and Hernandez who calls Bayshore, NY his home, fought a fast pace, highly skilled fight that had the fans on their feet cheering throughout. There was little to separate the 2 fighters as they engaged each other freely over the course of the fight. Laureano improves to 6-0 3KO’S while Hernandez drops to 8-3 1KO. A special attraction 6 round female Middleweight fight between Kali Reis and Tiffany Woodard brought the house down. Reis, who had a huge following in attendance, started fast, throwing bombs with both hands landing flush on the chin of Woodard who showed an incredibly strong chin as well as a huge heart as she tried to fend off the assault of Reis. The action was non- stop throughout the fight and by the time the 6th and final was coming to an end the crowd was in an absolute frenzy. The 2 fighters received a well deserved standing ovation as Reis came away with the unanimous victory by scores of 60-54, 60-53, and 59-55. Reis improves to 13-6-1 4KO’S while the tough Woodard drops to 4-9-3 3KO’S. New Haven Light Heavyweight Charles Foster improved to 14-0 8KO’S scoring a 5th round TKO over Quentin Rankin, 12-4-2 9KO’S, in a bout scheduled for 8 rounds in the Light Heavyweight division. In another war on the card, Dan Murray bested previously unbeaten Valerio Nocera, who was making his U.S. debut by scores of 38-37 twice for Murray while Nocera won on the other judges card by the same score of 38-37, in a 4 round Jr. Welterweight matchup. A debatable 3rd round knockdown scored by Murray was the difference in the fight. Murray improves to 3-1 while Nocera falls to 3-1-1. Sequan Felton, 2-2, upset debuting Bridgeport fighter Carlos Marrero in a 4 round Jr. Lightweight contest by scores of 40-35 twice, and 39-35. Marrero drops to 0-1. Promoter Joe DeGuardia had these comments on the night’s action “While the main event may not have been all fireworks and bombs, the rest of the card was. From start to finish the undercard and co-feature had everything you could ask for, knockouts, close matchups with razor thin decisions and upsets.